8 HP RearTine Tiller Details - Quasius Equipment, Inc. The Honda FRC800 Rear Tine Tiller is a heavy duty tiller that is easy to handle and has lots of power for those tough tilling jobs. 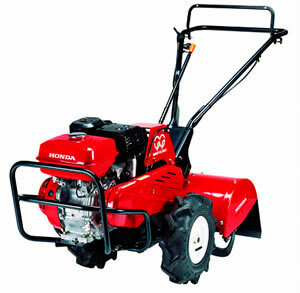 It utilizes a Honda 8 HP commercial series engine driving a gear reduction chain drive to put maximum horsepower down to the ground where it's needed. The 3 speed transmission also includes a reverse gear to get out of tough spots. The full loop handle lets you operate the tiller from the center or from either side.